AC ADAPTER FOR TOSHIBA, ASUS, LG 75W 5.5*2.5mm [NC552575W] Voltage : 19 VCapacity : 3.95 APowe..
AC ADAPTER FOR TOSHIBA A100 NOTEBOOK 15V 6.3A 6.3*3.0mm 6-Months Warranty..
Charger for ASUS EEE PC 1001 Series 19V 2.1A 6-Month WarrantyInternal Code : NCASEEE1001Warranty : 6..
charger for Asus Notebooks 12V 3A 4.8 * 1.7 6-Month WarrantyInternal Code : NC481736W Warranty ..
Charger for ASUS VivoBook Taichi 6-Month Warranty Voltage : 19 v Current : 1.75 APower : 33 W ..
Notebook Charger for Mini Acer and Dell Notebooks 5.5*1.7mm 1.58A 30W warranty : 6month intern.. Replacement AC Adapter for ASUS Notebooks 9.5V, 2.315A, 22W, 4.8*1.7mmVoltage : 9.5 v Current : 2.31.. REPLACEMENT AC ADAPTER FOR HP NOTEBOOKS, 18.5V, 3.5A, 65W, 4.8*1.7MM, YELLOW TIP - 6 Months Warranty.. 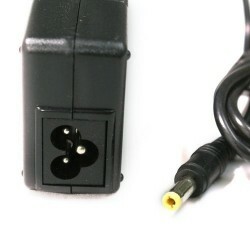 Replacement AC Adapter for Samsung / ASUS Notebooks, 12V, 3A, 36W, 2.5*0.7mm Internal Code :&n.. Replacement AC Adapter for Toshiba Notebooks Voltage : 12 VCapacity : 3 APow.. Replacement AC Adapter for Lenovo & Fujitsu B470 5.5*2.5mm Voltage : 20 VCurrent : 4..